This past fall, I stepped briefly out of the realm of curating music and into the realm of creating it when I attended a community Celtic harp class with a friend. For years, the beginning harp courses at MJC have been taught by veteran performer Margie Butler, of world-renowned trio Golden Bough. As a performing artist and teacher for over forty years, Margie has taught hundreds of students and inspired thousands more. Her creative talents embrace vocal and instrumental music, as well as dance and teaching. She expresses her passion for Celtic music through her nimble playing of the Celtic harp and Irish penny whistle, and her clear vocal renditions of the ballads that capture the eternal emotions of love, loss, and longing. Margie's earliest musical influence came at the knee of her father, the talented Irish Tenor, William Butler. Derek Bell of the Chieftains was a friend and a musical mentor, who described Margie's music as a breath of fresh air. Margie graduated from The United States International University of Performing Arts. The harps that Margie plays are based on the ancient harps of the Celtic lands. These harps were carried by the harpers throughout the countryside, bringing music and tales to the people. In much the same manner, Margie tours worldwide with Golden Bough, bringing this music to the modern audience. 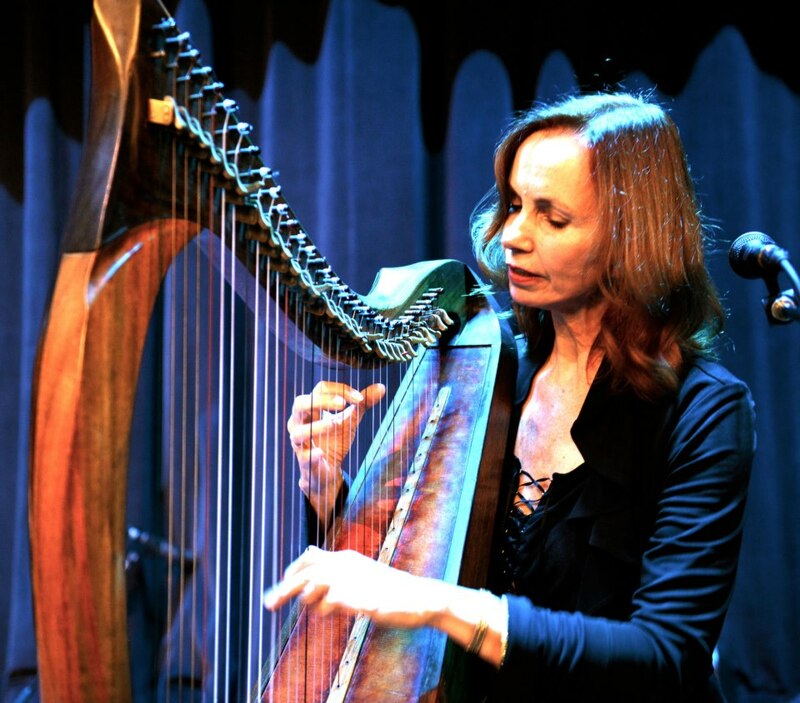 She has recorded four critically acclaimed harp CDs and has been a guest artist on several recordings, including guest harpist for Linda Ronstadt’s Grammy-winning 1996 album, Dedicated to the One I Love. Golden Bough was founded in 1980 by Margie and her musical partner, guitarist Paul Espinoza, who had already been performing as a duo for years. The group is rooted in the traditional music of the seven Celtic nations - Ireland, Scotland, Wales, Cornwall, The Isle of Man, French Brittany, and Spanish Galicia. They quickly became a popular and in-demand group on both sides of the Atlantic, attracting attention from reviewers on both coasts of the U.S., Australia and elsewhere. Their first European performances were in the streets and small folk clubs of Ireland, England, Scotland, Wales, Germany, Holland and Switzerland in the early `80's. These simple beginnings soon led to major tours of European cities and a recording contract with a top European World Music label. 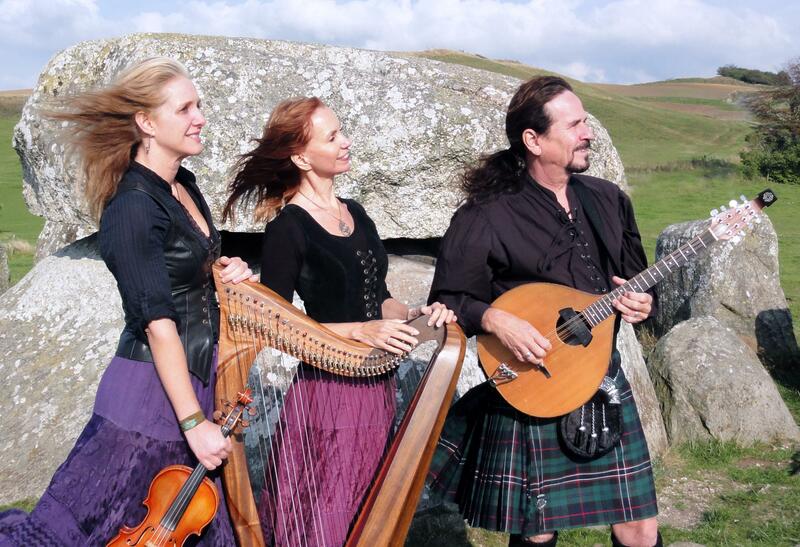 Since their beginning, Golden Bough have released nearly thirty recordings of Celtic and original music. Blending their voices in pristine harmony, they back themselves on an array of rare and more common acoustic instruments: Celtic harp, guitar, mandolin, octave-mandolin, accordion, violin, viola, penny-whistle and bodhran. To date they have released over 30 recordings. In April of 2001 Kathy Sierra joined Golden Bough and brought a new level of energy and excitement to the band. Her vocal harmonies blend naturally with Paul & Margie and together the three create a rich, full sound. In the recording studio, as well as on stage, Golden Bough captures the essence and joy of traditional music. Margie is also the director of The Central Valley Youth Ensemble, a group composed of several of her teen and preteen students, who perform on harp, penny-whistle and guitar several times a year at senior homes and churches. Margie also teaches harp and pennywhistle workshops for adults and young musicians in college, school, and music festival programs. In July, Golden Bough will host their 3rd Biannual Celtic Music Cruise to Alaska. Music workshops, dancing, concerts and spontaneous jam-sessions create an atmosphere of fun and stress free learning and interaction. Add to that the beauty of Alaska and it’s easy to see why this is a popular event. You can learn more about the cruise at www.montrosetravel.com/Goldenboughalaska. Also upcoming this year for Golden Bough will be a new recording, touring festivals and concerts on the West Coast during the summer and returning to Europe in the Fall for a tour of Switzerland, Germany, Holland, Denmark and France. One of the highlights of the tour will be headlining the International Highland Games in Trebsen, Germany. On March 6 Golden Bough will perform a St. Patrick’s Day Concert here in Modesto at Congregation Beth Shalom, 1705 Sherwood Avenue. The concert is a 3:00 PM matinee. Families are encouraged to attend. You can contact CBS at (209) 571-6060, or via email: info@cbsmodesto.org.